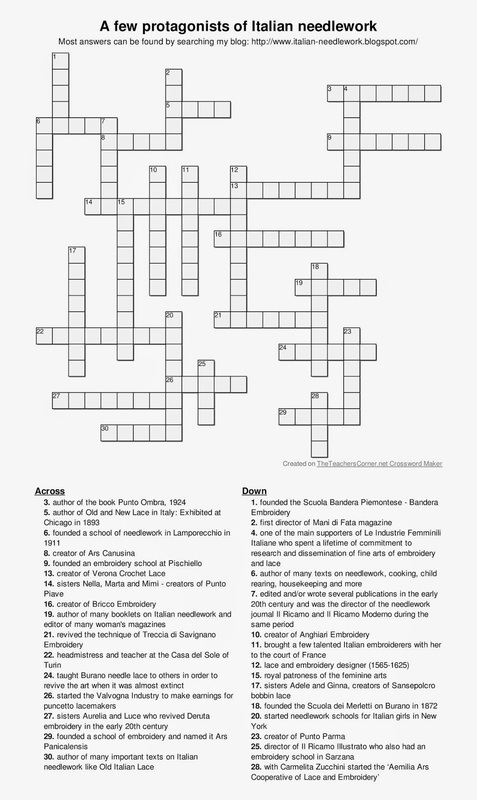 A lady from my chapter of the Embroiderers Association of Canada made a crossword puzzle out of needlework clues and I thought it would be fun to do one involving a few names from the history of Italian needlework. Most answers can be found by searching my blog, I tried not to be too obscure in the clues. Post a comment with your email addy if you'd like the answers sent to you. I hope this is as fun to do as it was to make! Click on the puzzle for a closer look. There is an ever-growing, never-diminishing stack of books on the floor beside my desk that I refuse to put away in my bookshelves because I want to tell you about them. 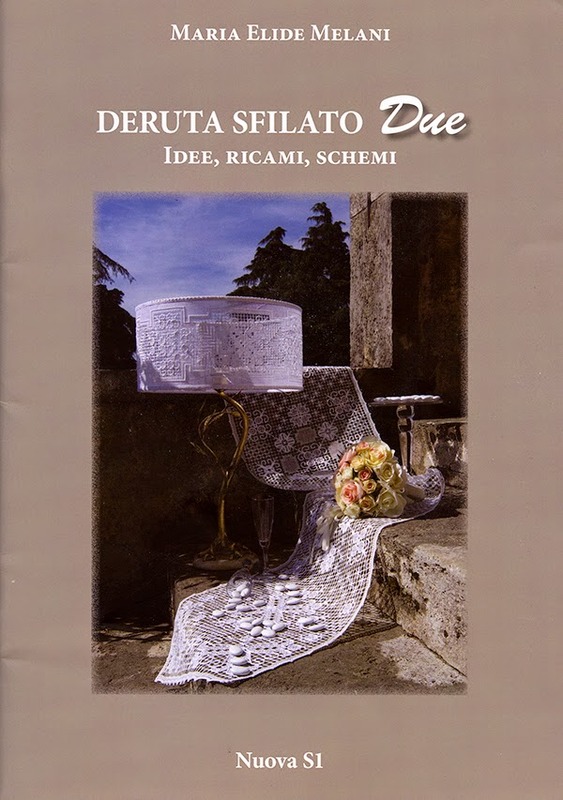 I am woefully behind due to many projects that have more demanding deadlines but today I find myself with a few minutes and I want to tell you about a book which is filled with exquisite Deruta Drawn Thread Work embroidery or Deruta Sfilato as it's called in Italian. This book actually came out last September and is the second for Maria Elide Melani of Ago, Aga e Fantasia on this beautiful and delicate Italian needlework technique. You can read about the first book here. The forgotten history, the tradition of a lost embroidery that I rediscovered retakes shape and transforms, leaving room for imagination in the creation of small, simple masterpieces. Passing the time to recover the memory, studying old trousseaux and taking inspiration from the designs of many years ago, I felt the need to give a new utility to this embroidery. The fragile cloth is intertwined with needle and thread, faithful to traditional motifs, but here ideas and new colours are born with unusual designs. Purses and pillows in the colours of spring take form together with small lampshades, a delicate little dress which makes you think of a big party, not to mention the color red that offers many ideas for Christmas and many other pieces, outside of tradition and unthinkable until only a few years ago. The simplicity of the execution is accompanied by instructions and photos which illustrate the various stages of the work, making it easy even for less experienced stitchers. I wanted to introduce this book with only a few words because my intent is to let the embroideries and patterns "speak" and, with a personal touch, they can be perfectly adapted to any embroiderer. The book is 60 pages long with many large full-colour photos. The text is in Italian but step-by-step photos guide you along the preparation of the fabric, the mounting of the fabric into the frame, the series of stitches used in this technique and how to execute the various motifs. The only thing you'll really have to spend some time translating (use Google!) are the six sentences about care and washing when you're done. There are 22 patterns for the most exquisite projects: a handbag and workbasket, dress hemline and table runners, several stitching project bags, table centres, towel borders, lampshades, pillows, curtains, Christmas tree decorations and tablecloths. You can see a preview by clicking on the larger photo of the book on this page here. The book is available directly from the publisher Nuova S1 - they accept PayPal, or through Tombolo Disegni - send an email to order; or from Lacis in the US.